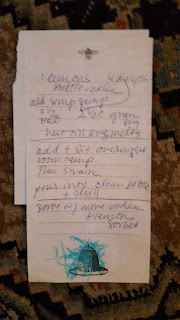 I made this recipe once before in the summertime when the humidity was so high that the bottle began to sweat as soon as I pulled it out of the freezer. Which makes any drink look enticing and mouth watering when you are parched from the summer heat. Our friends who had come over for dinner after a long day chasing toddlers on the beach complained the next day of their headaches perhaps having overindulged in this magical elixir poured ice cold into my mother's fancy liquor glasses. As a child, I always admired the cut out metal holders and the curved fluted glass and wondered why they weren't put to use. I figured they were too fancy. But Val never liked the taste of liquor. And my father only ever drinks beer so there they sat, lonely in the back of the glass china cabinet for years until I was old enough and lucky to acquire them. Well, we certainly christened those glasses that hot summer night! There were numerous toasts to this and that but I don't recall any of them, myself. It was my sister, Karyn who jogged my memory of making limoncello. She was in search of a pure recipe, without any additional additives. The woman has a finicky stomach but isn't about to give up her nightly cocktail. She is a creative home mixologist and comes up with delicious and knock your socks off combinations which have been featured on this blog before. 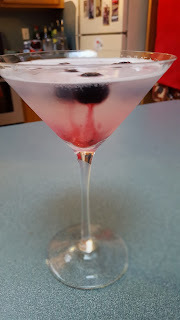 Her latest involves Blueberry Schmirnoff Vodka and limoncello shaken over ice and garnished with frozen blueberries. So simple and elegant, it demands just the right lemon flavor. 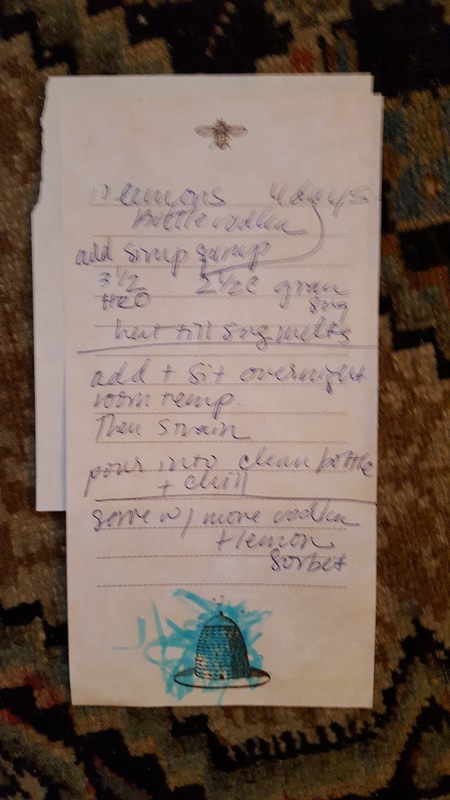 I dug through my old files to find a scrap of paper with my horrible chicken scratch handwriting noting difficult to decipher directions and a few measurements. I had taken the recipe notes from one of Giada's shows on the Food Network, before they were a power house presence online and one could easily download and print their recipes. This was long before you could pause your T.V. to grab a pen and paper, so as I continued to listen to the show, I must have scrambled for the nearest available tools. Here are my original notes, complete with embellishment by my then three year old. You can see for yourself that I was lucky to be able to figure out what it all meant. I'm glad I was compelled to search for the recipe as I ended up making a batch to give Karyn as a birthday gift. What more could you want than a big bottle of homemade booze? She put it to good use immediately. We enjoyed it in her fancy blueberry and lemon cocktail and I'm sure she enjoyed it over ice as well as just swigging it out of the jug, as is her nature. Wash the lemons. Using a vegetable peeler, peel the zest off the lemons being careful to not have too much of the white pith attached. Add the zest to a large pitcher or jug. (Use the rest of the lemons for another recipe.) Pour the vodka over the lemon pith in the jug and cover. Allow to steep for four days. On the fifth day, combine water and sugar in a large sauce pan. Bring to a simmer just long enough for the sugar to melt. Allow to cool to room temperature. Add the sugar and water combination (simple syrup) to the vodka and lemon pith. Cover and allow to sit overnight. On the sixth day, strain the lemon pith out by setting a fine mesh sieve on a large bowl or another large pitcher. Pour the lemon/vodka mix into the sieve and bowl. Discard the lemon pith. Pour Limoncello into a resealable jug or small bottles. Can be placed in freezer to keep chilled. Fill two martini glasses with ice and water to chill. Fill a cocktail shaker half full with ice. Add the blueberry vodka, limoncello and lemon juice. Let sit for a minute to melt the ice a bit. (A little water in the drink, makes a good cocktail.) Shake vigorously. Dump out the ice water in the martini glasses, then strain cocktail into martini glasses. Drop 2-3 frozen blueberries into each cocktail. 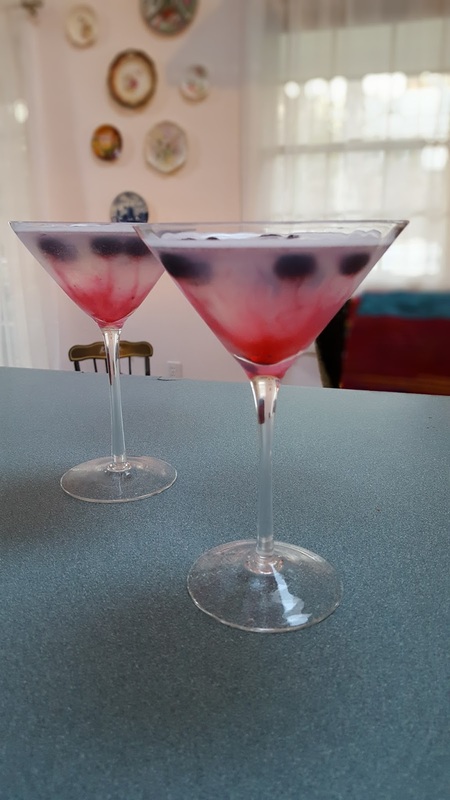 Allow for blueberries to begin to melt and create "legs" in the drink. Serve and enjoy!